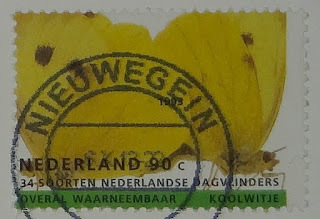 This isn't the prettiest of butterfly stamps, but I was intrigued by the 'koolwitje', which translates to 'cabbage white'. Even though this fellow is most definitely yellow. And might they be engaging in some mating activity? It is widespread and populations are found across Europe, North Africa, Asia, and Great Britain. It has also been accidentally introduced to North America, Australia and New Zealand. The caterpillar of this species is seen as a pest for commercial agriculture. Often referred to as the "imported cabbageworm" they are a serious pest to cabbage and other mustard family crops. The species has a natural range across Europe, Asia, and North Africa. It was accidentally introduced to Quebec, Canada around 1860 and spread rapidly throughout North America. Estimates show that a single female of this species might be the progenitor in a few generations of millions. It is absent or scarce in desert and semidesert regions and is not found in the Arctic, nor on Channel Islands off the coast of southern California. By 1898, the small white had spread to Hawaii; by 1929, it had reached New Zealand and the area around Melbourne, Australia and found its way to Perth as early as 1943. It is obviously a strong flier. Overal waarneembaar translates to seen everywhere. Another strong flyer is the Monarch which travels 4,000 kms from Mexico (winter home) to Canada (summer home) seen here on this 22¢ stamp issued in 2014. To prevent stockpiling when the price for a domestic stamp was announced, all 'P' (or 'permanent') designated domestic stamps were taken out of circulation and reissued with the (then) current rate of .63¢. Once the date came for the new .85¢ stamps, these .22¢ were issued so you could add them to your .63¢ They became an addition to the beneficial insect series. Monarchs are a symbol of metamorphosis for their ability to transform from caterpillars to adult butterflies through chrysalis. 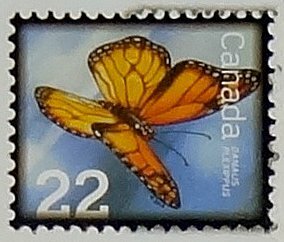 In a similar way, this monarch 22-cent low-value definitive will transform your 63-cent stamp into the current domestic rate. 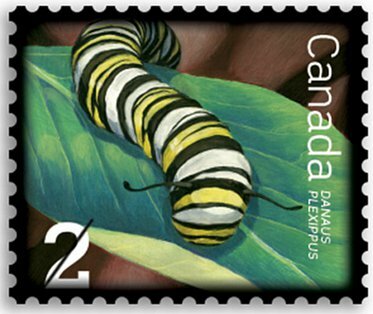 The “make-up postage” stamp features Keith Martin’s unique illustrative style found in the extensive series of low-value definitives issued over several years. Although not yet on the endangered list, there is some concern about the Monarch's ever decreasing numbers, due to deforestation and natural disasters in Mexico and destruction of milkweed which they depend on to lay their eggs. A program to encourage people to plant milkweed has been hatched. Having looked at quite a few sheets of Netherlands stamps over the last few years, I am sure that more of those yellow butterflies can be seen in the selvage. Thanks for showing a caterpillar - I like this stripy guy! you are probably right - and with more research, I found that the undersides of their wings are a 'mustardy yellow' while only the upper are white. Hello fellow Tour de France watcher! Has not his flying-crooked gift." Thanks for including this poem. I feel like I should have known more about this butterfly. Amazing when some butterfly species are in such decline the cabbage white is so prolific. I've just thought it's not often one sees caterpillars on stamps and now two have appeared on Suday Stamps already. The low value definitives are one of my favourites. Well, being so picky - or specific - doesn't help the Monarchs. These insect stamps are my favourites, too. Cool. I am a big fan of butterflies and have planted a lot of butterfly-friendly plants.